Introducing Anthropology: An Integrated Approach is a concise text for the introductory-level, general anthropology course. 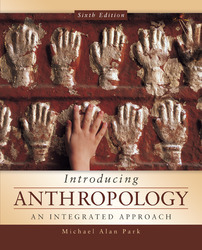 The student-friendly format presents a unique holistic approach to anthropology, examining the bio-cultural nature, evolution, and behavior of the human species. Park’s engaging narrative and thoughtful level of detail makes anthropology both interesting and accessible for students. To purchase an electronic eBook version of this title, visit www.CourseSmart.com (ISBN 0-07-733185-0). An updated Online Learning Center features additional learning and teaching material, including a multiple choice and true/false quizzes, a chapter overview, and learning objectives for students; and an instructor manual, test banks, and PowerPoint presentations for instructors. A new discussion of taxonomy. "Notes, References, and Readings" sections at the end of each chapter include citations from the chapter as well as references to other sources of information on the chapter's topics for further study.